The first week of Spring Break is over. It was a mixture of mostly pleasant and a bit of unpleasant, the latter including a dental appointment. How I dread even a cleaning appointment. All those sharp instruments. The feeling of helpless vulnerability. It's over for another six months and I'm relieved. I haven't had as much time to relax as I thought I would. Several appointments, and fun time with family filled the days. Finding balance can be a challenge. There's so much possibility, but limited energy and time. Our visit to Butterfly World (previous post) and a tea party on Friday were the highlights of the week. Three adults watched three little ones enjoy their tea. The girls dressed up; one with a crown and her Easter dress, the other with a sparkly dress complete with a jewel. The sole male at the event wore the cutest blue jean overalls. What fun to have tea, just a little, with lots of milk added, and sugar lumps! Stir, stir, stir. Sip, sip, sip. Scones with jam and whipped cream, simple savories including cheese and crackers and peanut butter banana sandwiches, deviled eggs, and a few vegetables meant that there was something to please everyone. This week flew by and there was little time for blogging. Next week will be the same. Finding balance. 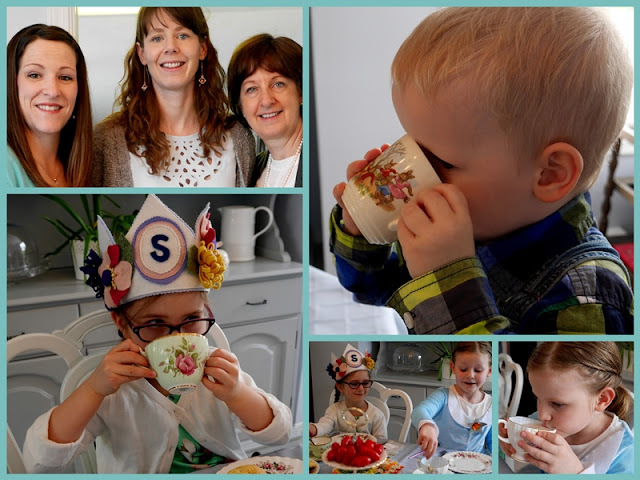 Ever since I was a little girl I've loved a tea party, it's so lovely to see your grandchildren enjoying theirs. Did I spot little mister sipping from a Peter Rabbit mug? I had one of those! I can empathise with the dreaded dentists visit, I hate them too, I'm due for some treatment next month and not looking forward to it at all. Happy Mosaic Monday, here's hoping it's the start of a wonderful week for us all. Such sweetness to share - and such darling little sweetie pies. Memories they will hold forever in their hearts. The table is wonderful and everything looks delicious. Enjoy your week ahead and you try to balance. Don't you wish this rain and cold weather would go away and give us some warm sunshine? What a precious teatime. I love a good tea party, especially with my two little grand nieces. What lovely & precious kids ❤︎ Your tea party sounds so joyful with beautiful rose cups & delicious bakings. Happy MM! I'm terribly uncomfortable with the dentist. It's hard but we solider on. I know you are relived for another 6 months. What a lovely tea time.. I'm so impressed by the sweets. I'm so looking forward to doing this with my grand girls as I did with my daughters! How wonderful to have tea with your " grandlittles", Lorrie! I have to do that with my grandgirls when they get a bit older. I also had a 6 month teeth cleaning this past week. My dental hygienist is very gentle but I always worry they will find a cavity or such that needs work. Thankfully all was well this visit. Your tea party looks lovely, and reminds me of the ones my grandmother used to arrange. All sorts of delicious tea time foods. I know what you mean about the dentist, we both dread our visits. It sounds like you have two weeks of spring break?? Nothing quite like a tea party and your tables is laden with lots of goodies. The key, at least with my little girls, is the stirring of the sugar, and lots of it. Hope you have more down time this week. Ugh. I feel the same about visits to the dentist. I sit in the chair and say to myself, "I am never doing this again." But then I do. Sigh . . .
Have a lovely second week of spring break! Enjoying your family is far more important than blogging. You have a gorgeous family. hugs. I absolutely LOVE your tea party. What wonderful goodies and attendees. To me this is just the perfect way to spend with family. Take care and come back when you can. That crown just made me smile. Fun,lovely food, and family ... wonderful! Oh the Tea Party looks like it was a lot of fun. I would so enjoy that. Lorrie, your balance seems to be fine. Dentists are always with us but family time is a joy. I'm so embarrassed. Your tea time looks delicious. Mine with 2 little granddaughters this weekend was only pretend. But the spilled tea was easy to clean up. Tea parties are always fun! Glad you enjoyed your spring break. Except for the dentist part. Bleh! Sounds like a delightful week and I am so glad that another is here. You will fill it wisely. Lorrie, that tea party looks deliciously fun! I want to taste everything! I'm with you and dentists. Not a fan. I smiled when I saw your grandkids sipping daintily from your teacups. So cute! I have a dentist appointment on Friday. Ugh! I love the tea photos and description of what each of the littles were wearing! What a lovely tea party - the food looks delicious! Dentist appointments don't bother me but the appointment I do have coming up next month (done every 5 years) is one I'm dreading. The preparation......let's leave it at that. Enjoy your break and seek the balance! Food for thought for me Lorrie! My froggy family arrive home for good at the end of June...fingers crossed. Our little townhouse will be bursting at the seams! Tea parties are on my agenda so I loved seeing your photos. I would choose savoury eggs and scones. I know your feeling with time off and just too many other things interrupting your rest and 'time out'. I understand how hard it is being a working grandmere! I think we all find this from time to time. Tea Parties can be such fun! When one indulges in such sweet, family time, finding balance seems to go on the back burner. Don't we all wish that those dreaded dentists appointments could simmer on low for a long while, too? In the meantime, teatime, with its tasty treats, looks like it was a lot of fun. Oh oh oh scones. Jam. Tea party. Awesome! You've had a busy week last week and now you're half way through another week of spring break. Time goes too fast, especially with grandkids to entertain and enjoy. The tea party looks really lovely and the food looks delicious. Enjoy the rest of your break Lorries. Lovely lovely. What a tea party! Wishing you a lovely time for the rest of your Spring break. Ahhhh Lorrie, what a fun tea party for everyone involved! Have fun for the rest of your Spring break. At least the dental appointment is through! Love your tea party pic's! Most special...and so nice to have the 'wee gentleman' there too. You are making the best memories with your grands. Playing catch-up here and read the last three posts. Beautiful evocative writing and your tea party....well the children are just adorable and the food looks wonderful. I am leaving with a horrible craving for deviled eggs. Ten-to-one I'll make some tomorrow, thanks to you, lol! A proper tea party! I'm sure the little ones loved it. I hope the tea party came after the dental appointment, to soothe your nerves. The mouth is such a personal place to have strangers poking around - very upsetting, and I never get used to it, no matter how calm I appear on the outside. Hi Lorrie, I love these pictures!! I so enjoy seeing a table set so prettily with lots of goodies spread out for teatime. The grandchildren are darling; the girls look so pretty and the little boy is so cute. :D I can tell everyone had a good time!